It’s the most horrible feeling when you go to look for a size on something you want only to find your local store has run out of the exact sizes you need. At Sears.com you’ll find everything you need plus all the additional styles and sizes so you know you’ll always be able to find that deal you really want. You’ll find more colors and sizes online at Sears.com than in stores. While you are at Sears online you’ll want to take a peak at all the other exciting new additions. 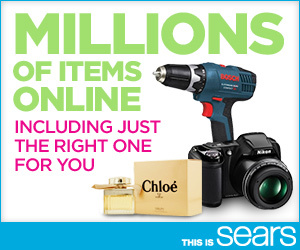 You’ll find designer brands and items you’ve never seen before at Sears! The Sears website has also been updated and after shopping around a bit I realized just how great the new site is. It’s fast and it’s even easier to find the items I’ve really been looking for. I honestly was shocked at just how many new items there are at Sears and now I have just another reason to love the store! Everything from high end electronics to designer styles for summer you can find it all now at Sears! Just check out some of these deals! Brands that dads will love like Craftsman are offering great deals this time of year for Father’s Day. You’ll find just about everything mom will love at Sears. From fitness to fashion there are so many gifts to give and to love this gift giving season! You’ll want to check out all the newest arrivals. I just love the selection of jewelry for mom. And tools dad will love! Another reason to love Sears is all the points you get for shopping with Shop Your Way Rewards. I also love the site to store shipping because it’s FREE! Plus you’ll get FREE in store pick up and tons of freebies and rewards coupons for being a Shop Your Way Rewards Member. Online I found a number of killer deals so always check online and in store for the latest deals and promos. I’ve had the Sears staff be incredibly helpful when it comes to sales and they always are helping me get exactly what our family of 5 need! Shop Sears today and check out the featured marketplace offers.